We helped run a fundraiser this weekend to raise money for the local food bank. I am always amazed to see how the community gets together when their help is needed. The organizer Angela put out a call for volunteers to help set up the coffeehouse and for bakers to donate baked goods so we could sell them and have the proceeds go to the food bank. The response was amazing. So many people turned out, both to provide their labour and yummy goods. We organized the musical portion of the event. We performed a few sets along with local flamenco band Spice on Ice, but for most of the day we opened the floor to other local musicians to play some songs. I was really glad that a lot of people came up to perform. Since Cambridge Bay doesn't have any concert halls, bars, or theatres, there aren't a lot of opportunities to see live music, so it was really neat to see such a diversity of acts coming from one little town! We performed some of our originals as well as Christmas carols. We also played a cover of "Do You Want To Build A Snow Man" from the movie Frozen, and that was a huge hit with the little girls. There was literally an army of tiny kids lining up at the front, mesmerized and singing along. It was so cute, I almost stopped playing. A lot of people turned out for the coffeehouse - it felt like the whole town was there! I think people just enjoyed having a chance to do something fun with their friends and family in a warm place, especially after being out in the -50 windchill weather for the Santa Claus Parade (aren't Northerners brave??). By the end of the event, we were completely sold out of baked goods and we had raised over $3000 for the food bank. We've had these events a few times now, and I am always pleasantly surprised (and touched) by the generosity and talent of Cambridge Bay. It's almost as though people are just waiting for the chance to help. It really helped us get into the Christmas spirit, especially since it was the last day that the sun would rise this year. From now on, with 24 hours a day without sunlight, we'll have to be relying on our friends and loved ones to keep our spirits up. Mason, our sound guy, is awesome. time to recruit a new member of the band? 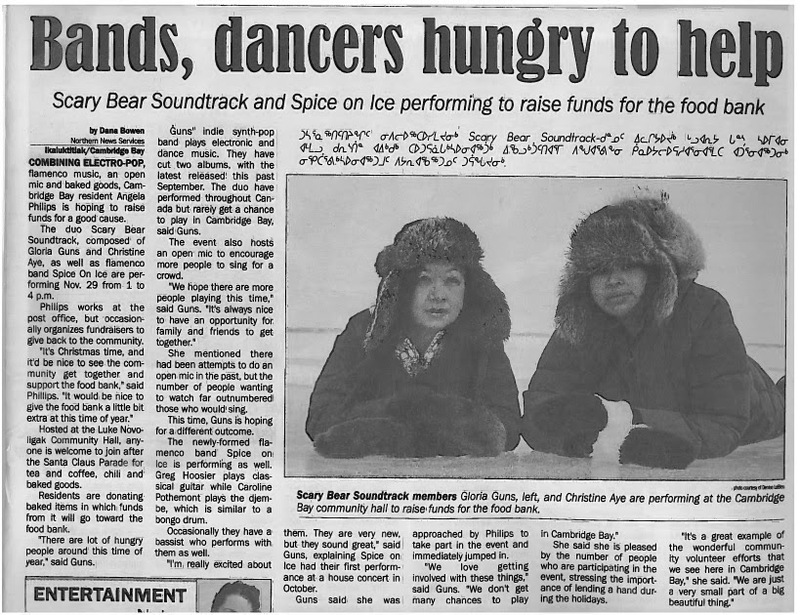 The Nunatsiaq News published an article about the event here.